Posted on February 27, 2019 by Elizabeth E.
First you saw this, way back in December of 2018. I had this idea in my head and with a stack of Alison Glass fat quarters from Andover, I decided to try it out. At the center of the square is park, with interesting tributes to famous Irish poets and writers, so I had to include the bushes and trees. Then I changed it up a bit, making it a rainbow of scrappy and leaving off the border. And then this version emerged from my late-night tinkering around. Because of the (ahem) shoulder situation, I can’t quite quilt it yet, but I was able to sew it together. (I think this is my favorite.) I have since made three of these: one to send off for a sample for the Utah Valley Quilt Guild Workshop, another to head to the Valley of the Mist Quilt Guild, where I’ll be teaching it again in May, and one to hang around, just so I can look at it. I worked with my new Affinity Publisher Beta software and wrote it up, and now it’s available for sale in my PayHip shop. Both versions are included — well, really, all three versions are included — if you go there, you can click on the little banner in the upper right corner and download a Preview, which includes a list of fabrics needed to make these. Some of you may have seen this on Instagram today. 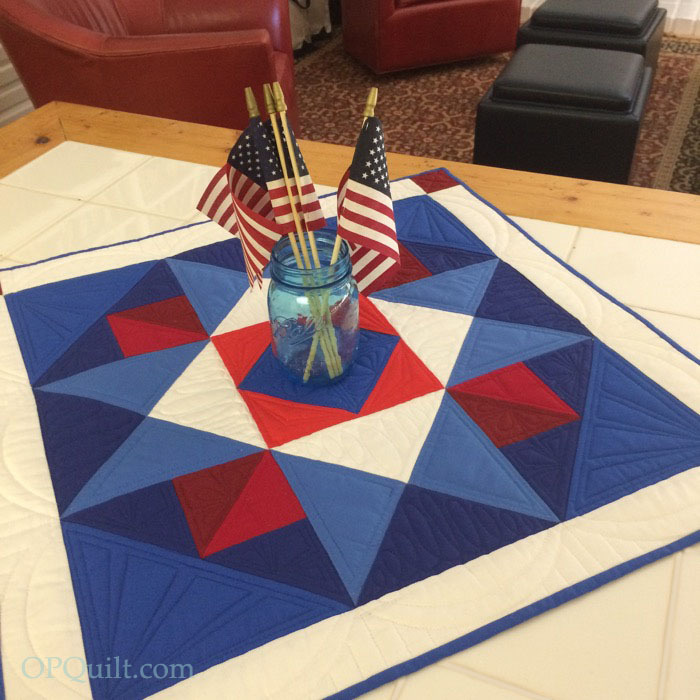 I’ll be teaching this for the first time at a workshop with the Utah Valley Quilt Guild. I’m pretty excited about it. I’ve had this idea floating around just as long as the others, and am looking forward to putting this together, too. The pattern is $10.00, has 13 pages of colorful illustrations with clearly written directions. It is available for a PDF download, and you can have it immediately. I hope you have fun making this! Posted on June 9, 2018 by Elizabeth E.
The requisite shot of the X-ed out Frivols tins show that I’m now halfway done with my goal. I try not to set goals, as they just give me angst, but there’s just this lingering expectation: finish all the Frivols. I call this Practice Makes Perfect, as I’ve been thinking about the nature of work, and how much of it is repetitive, boring even, but repetition appears to be a necessary step on the way to mastery. I think I can handle churn dashes, but it was learning the finer points of free-motion quilting loops that needed my attention. The freebie for tin #6 was this strawberry label with barely any room for a person with two long names. It would have been better if my name were Dot Smith or something. I had started on this quilt at the end of May, after a long month of travel and serving and caring for people in my life, culminating with an intimate luncheon celebrating my mother’s 90th birthday in Ogden, Utah. We rented a small conference room at a local hotel, and had the hotel cater the meal. We’d done this two years earlier for my father’s birthday, and had only my brother and sisters and parents there, with no spouses or great-grandchildren. We were worried then (I was wondering) if if it would work without the supporting members, but we did fine two years ago, and again this year too. The feelings expressed to my mother were tender, kind, showing her (and my father’s) careful influence in our lives. Because of them there are amazing individuals in my family: strong men and women, who are good men and women, too. I had little bottles of specialty olive oil etched with the saying “Olive you forever” and “Happy 90th Barbara” (my mother’s name). We drove home and two days later I quilted this, finishing it the next day. I was still putting away what I’d gathered on my trip, but needed a break, and Practice Makes Perfect was the tonic for what ailed me. John Piper wrote: “Work is a glorious thing. And if you stop and think about it, the most enjoyable kinds of leisure are a kind of work. Both these facts are true because the essence of work, as God designed it before the Fall, was creativity — not aimless, random doing, but creative, productive doing…. “If you are starting to grow lazy, I summon you back to joy. God made us to work. He formed our minds to think and our hands to make. He gave us strength—little or great—to be about the business of altering the way things are. “That is what work is: seeing the world, thinking of how it could be better, and doing something—from the writing of a note to the building of a boat; from the sewing of what you wear to the praying of a prayer. Posted on April 9, 2018 by Elizabeth E. ACK!! It was 93 degrees today!! My snow-covered Orangeman (or Snowman, made of oranges) has his arms thrown up in amazement/horror. While Rachel and Carol show snow days on their IG feeds, we are already burning up out here. My newly planted zucchini and spaghetti squash plants are wilting, and it’s only April. 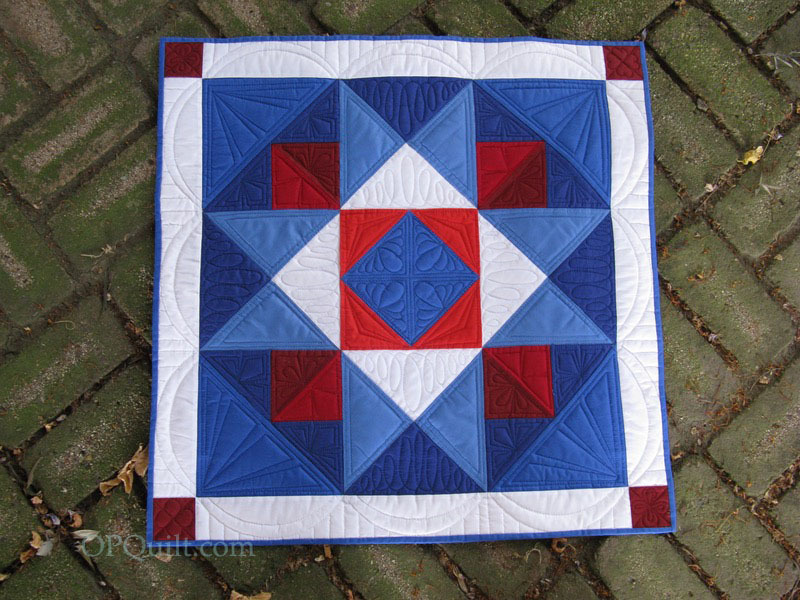 The origin of this mini quilt (tutorial is here) started when I first moved here, and commuted an hour to the Orange County Quilt Guild. We had a block swap, and the theme was snowman, and since I was a newbie, I think I got all the rejects. Except this one…which was my own (I made one for myself). One snowman block was a zig-zagged stitched pair of stacked circles, with two hot-glue-gunned twigs for the arms, and dots of makeup for the coal and eyes. Yes, I threw that one away. 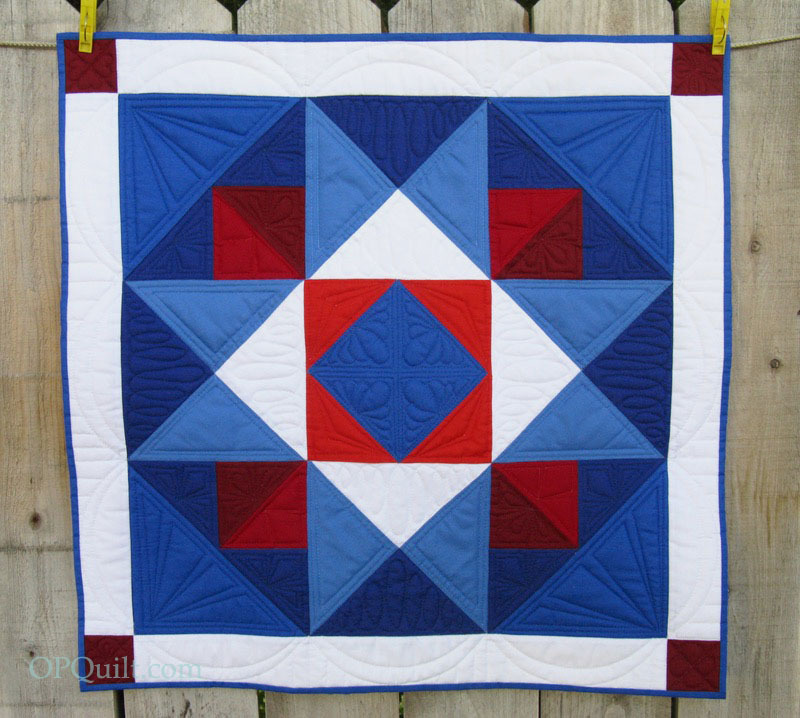 But in looking for another project in my Orphan Blocks Box, I found this one, and turned it into a Mini-on-a-Frame quilt. I bordered it with those fabulous swirls, quilted it and trimmed it up). I backed it, and slipped it on its stand. Now I’m up to four of these mini-quilts-on-a-frame. Given the success of this one, I may turn other orphan blocks into bits of art to be displayed! PS: Swirl fabric is by Valori Wells, “Marks,” design #16354–by Robert Kaufman. A young mother in church yesterday asked me if I bought fabric for a single project, or if I bought it when I feel like it. This purchase was obviously the latter. Posted on August 1, 2017 by Elizabeth E.
It’s Four-in-Art Challenge Reveal day today, the penultimate challenge in 2017. 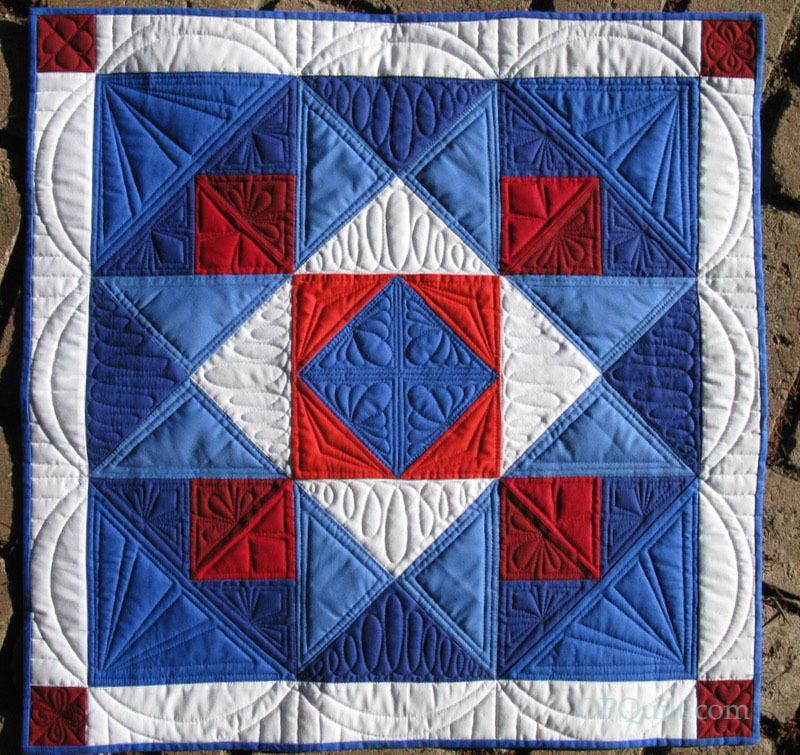 We began this art mini-quilt group in November of 2012, and we are in our fifth year. Bette, Rachel and I have been with the group since the beginning, with additions and changes here and there. It’s been wonderful to have this to look forward to four times a year, a chance to stretch and try some new things, all contained in a mini-quilt (we are more flexible with the size now, but originally, it had to be contained in a 12″ square). Since I chose the challenge of Stained Glass Shadows, obviously I’m in love with the highly saturated blocks of color left on the floors of cathedrals and churches when the sun shines through stained glass windows. I originally thought I’d try some figurative work, but the colors are what always catch my eye. So I began with the warm tones, adding the layers of earth-colors as they moved toward the bottom, and celestial-colors as it moved upward. I also knew that somewhere on this quilt there had to be a Rose Window, that enormous circular window high above entryway doors. Then it was quilt the background, and I went with the idea of the rose window as the center, with thread-streams of color coming out from there: navy and deep colors from the top and the warmer yellow-orange-red tones as the sun filters downward through the stained glass. My solid fabrics are Paintbrush Studio Solids, and the thread is Magnifico by Superior Threads (with Bottom Line in the bobbin) with some So Fine here and there, as the color dictated. Details of Rose Window quilting. Back of quilt, with standard label, and added corners for easy hanging. Our next challenge is Illumination, and will post on November 1st.